Since the first Trump-Kim Jong-un summit last June, little progress has been made toward US’ ultimate goal — getting North Korea to give up its nuclear weapons. Washington/Seoul: President Donald Trump said he’ll meet with North Korean leader Kim Jong Un on Feb. 27-28 in Vietnam, ending much of the months-long mystery over the details of their second summit on ending Pyongyang’s atomic ambitions. “Much work remains to be done, but my relationship with Kim Jong Un is a good one. 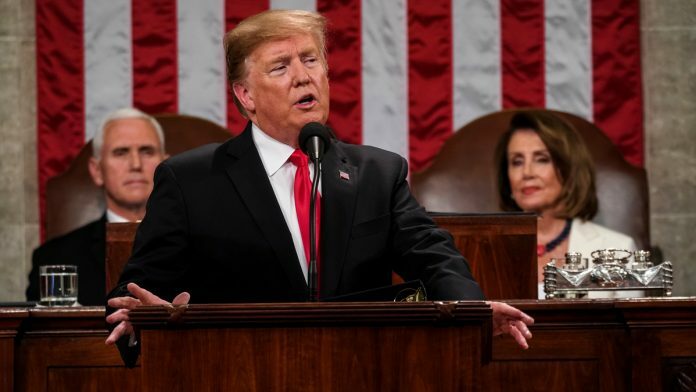 Chairman Kim and I will meet again on February 27 and 28 in Vietnam,” Trump said Tuesday in his State of the Union speech. Trump didn’t say which city in Vietnam would host the summit. Since Trump and Kim held their first summit in Singapore in June, little progress has been made toward the U.S.’s ultimate goal — getting North Korea to give up its nuclear weapons. Pyongyang has made no commitments to allow weapons inspections or dismantle its growing arsenal of warheads and intercontinental ballistic missiles. The two sides have been bickering for months over what they agreed to do in Singapore. Washington asserts Kim accepted the “final, fully verified denuclearization of North Korea,” while Pyongyang says the deal implied a step-by-step approach where its actions were simultaneously met by U.S. responses, such as relief from sanctions dealing a blow to its moribund economy. Kim has made it clear he expects to get at least some penalties lifted, denouncing them as “vicious” and threatening in his New Year’s address to take a “new path,” if the U.S. doesn’t ease off. U.S. nuclear envoy Stephen Biegun arrived in Pyongyang on Wednesday for talks with his North Korean counterpart, Yonhap News Agency of South Korea reported. The State Department said the visit is aimed at paving the way for the next summit and advancing the pledges made in Singapore. North Korean state media has yet to comment. Duyeon Kim, an adjunct senior fellow in Seoul for the Center for a New American Security, said the stakes are high for Biegun’s visit and follow-on negotiations because they are essential for making any progress at the next Trump-Kim meeting in less than a month. “Another summit that again ends with faux peace over real denuclearization steps and more American concessions than gains will botch any chance of curtailing Pyongyang’s nuclear weapons capability and could force the world to live permanently with a nuclear-armed regime,” Kim said in an email. Choosing a venue has been another major obstacle to arranging a follow-up summit.Both Trump and Kim, whose nations have been locked in a hostile relationship for almost 70 years, have intense security requirements. Vietnam had been considered a strong potential location because the communist state is a former Cold War ally of North Korea and a budding security partner to the U.S. Trump visited Hanoi and Danang in late 2017 and Kim would be able to reach the Southeast Asian nation largely by flying over friendly Chinese territory. Last week, Biegun said North Korea has promised to destroy all its facilities for making nuclear-bomb fuel, in a sign that Trump was seeking clearer disarmament steps from the next summit. While the U.S. still insists it won’t lift its sanctions on North Korea until it gives up its nuclear weapons, Biegun made clear in the speech at Stanford University that Trump would be willing to provide some form of relief or incentives so Kim feels he’s getting something in return for nuclear disarmament. Further complicating matters, Biegun acknowledged the two sides can’t even agree on what their shared pledge for “complete denuclearization of the Korean Peninsula” means. The U.S. says it refers to North Korea giving up its weapons of mass destruction. Kim’s regime suggests it should also include the U.S. agreeing to give up its “nuclear umbrella” protecting South Korea, possibly even by removing strategic bombers from Guam. Trump has staked much of his approach toward North Korea on his personal relationship with Kim, a dictator who tolerates no opposition and routinely sends his own citizens to gulags. In September, Trump told a rally in West Virginia that he and Kim “fell in love” after meeting at the Singapore summit and exchanging letters. Last year’s Trump-Kim summit drew some 3,000 journalists to Singapore, boosting the city-state’s hospitality industry and generating tens of millions of dollars of media exposure. While a second meeting would probably draw less attention, it could still provide a valuable moment in the international spotlight to one of the world’s fastest growing economies.